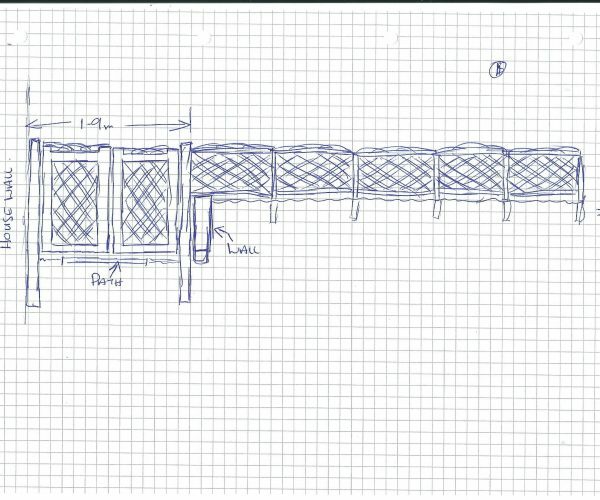 Please send a simple plan/sketch of how your fencing/arch/gate is to be positioned in your garden. Please include measurements of the total length of the fencing runs and height, together with any corners, slopes, arch widths (inside or outside measurement) and the height of any gate you may wish to be included. We can make fencing sections in any width up to a maximum of 6’/1.8m. Fencing sections can be made any height up to a maximum of 6’/1.8m. Measurements may be in imperial or metric. Please indicate which side it is to be viewed from, particularly with fencing. Please include the product number, as per website. We may need a little more information from you as it is in both our interests to establish exactly what your requirements are as we want you to be happy with the finished product. We may offer you some advice if necessary and then quote a price. Once an order is received from you, we will place you in our order book. Note: The example sketches on this page are drawn by ourselves after receiving your information. 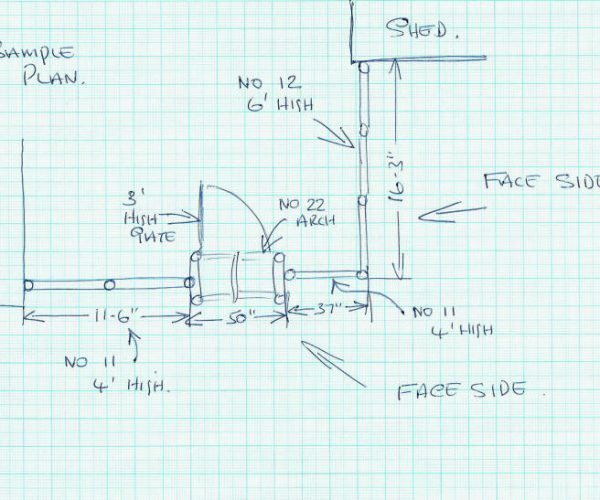 Your original sketch will not have to be this detailed as long as all the required information is available for us to work from.